A recent study published in the Journal of Endodontics is one of the first studies to directly compare the outcomes of nonsurgical endodontic therapy (NSRCT) with single tooth implants. Implants have long been accepted as a predictable treatment option for the replacement of missing teeth. However, recently, there are those who have begun to indicate that extraction and an implant may be preferred over endondontic treatment. There are those who argue that implants have a higher long term survival rate than teeth treated with endodontics. This is not an evidence based argument. Until recently, there was no research directly comparing the survival rate of endodontics and implants. The endodontic literature defined "success" as complete radiographic healing, absence of symptoms, & full function. (A tooth that had incomplete radiographic healing at the time of re-evaluation would not be considered a "success" by this definition even if it was asymptomatic and fully functional.) In contrast, the implant literature defines their success as "survival". An implant was categorized as "surviving" if it was still in the mouth at the time of re-evaluation. (An implant with a draining sinus tract that had not been removed would be considered "surviving".) This difference in definitions has caused much confusion and mis-interpretation of the endodontic & implant literature. The recent study by Doyle et. al. directly compared the NSRCT with single tooth implants. The retrospective study compared 196 NSRCT cases and 196 single tooth implant cases for success, survival, survival with intervention & failure. This definition of outcomes allows a more accurate comparison of the outcomes of endodontics & implants. Their results were very interesting. 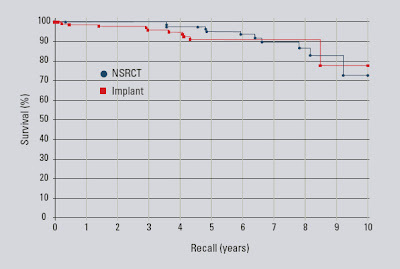 Their study found that NSRCT (when restored properly) and single tooth implants have similar failure rates over time. They also found that the implant group has a longer average and median time to function. This study directly comparing implants and endodontics, while one of the first of its kind, will not be the last. Dr. Walter Bowles, associate professor at the University of Minnesota, will be leading a team of researchers to conduct a similar retrospective study on a much larger scale. Dr. Bowles and his associates from the University of Alabama, University of California, San Francisco, & Ohio State University, will be evaluting 10,000 patients and use the data to provide a timeline for outcomes over a 10 year period. The project which recently began will take two and a half years to complete. 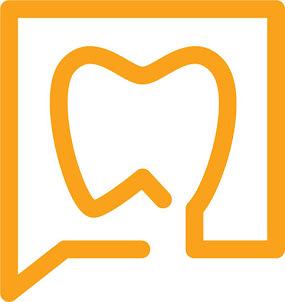 Evidence based dentistry helps us to make treatment decisions based on the best available clinical evidence, individual factors of each particular case, the clinician’s expertise & patient’s informed consent. The decision to restore a tooth with endodontic treatment or remove and place an implant should be based on other factors than long term survival rates. Doyle S, Hodges J, Pesun I, Law A, Bowles W. Retrospective Cross Sectional Comparison of Initial Nonsurgical Endodontics Treatment and Single Tooth Implants. J Endod 2006; 31. Hoffman, J. AAE-Funded Study to Compare Implants, Endo. The Endo Tribune 2007; 2:8, 2-3. Very interesting about the definitions of "success" - keep us posted on studies like this.